Many of us like to travel and some people are fascinated by the view of gigantic A380’ planes slowly navigating on tarmac with projected gracious and powerful determination. I too could not overcome a feel of fascination every time I observed these magnificent planes, they are really – literally big.. The airline industry however seems to have a more practical perspective on this matter – the volume of the A380s purchase is on decline and according to the recent reports Airbus is considering reducing their production based on growing preference towards smaller and faster airplanes. Although the connection may seem slightly tenuous, in my mind I see a fairly close analogy to this situation in EDS market, when the discussion comes to the size of EDS sensors. In modern microanalysis where the studies of a compositional structure rapidly become dependent on a time scale, the use of the large sensors can no longer be a single solution to optimize the signal. The energy resolution of an EDS spectrometer can be related to its signal detection capability, which determines the signal to noise ratio and as a result the energy resolution of the detector. Fundamentally, to increase signal to noise ratio one may choose to increase signal, or number of counts, or as alternative to reduce the noise of the detector electronics and improve its sensitivity. The first methodology, based on larger number of counts, is directly related to the amount of input X-rays determined by a solid angle of the detector, and/or the acquisition time. A good example for this approach would be a large SDD sensor operating at long shaping times. A conceptually alternative methodology, would be to employ a sensor with a) reduced electronics noise; and b) having higher efficiency in X-ray transmission, which implies less X-ray losses in transit from sample to the recorded signal in the spectra. Using this methodology signal to noise ratio can be increased with a smaller sensor having higher transmissivity and operating at higher count rates vs larger sensor operating at lower count rates. To understand the advantage of using a small sensor at higher count rates we can review a simple operation model for SDD. A time for a drift of the charge generated by X-ray in Si body of the sensor can be modeled either based on a simple linear trajectory or a random walk model. In both cases, we would arrive to approximate l~√t dependence, where l is the distance traveled by charge from cathode to anode and t is the drift time. In regard to the sensor size this means that a time to collect charge from a single X-ray event is proportional to the sensor area. As an example, a simple calculation with assumed electron mobility of 1500 cm2/V-1s and bias 200 V results in 1 µs drift time estimate for 100 mm2 and 100 ns drift time for 10 mm2 sensors. This implies that in order to collect a full charge in a large sensor the rise time for preamplifier needs to be in the range of 1 µs vs 100 ns rise time that can be used with 10 mm2 sensor. With 10 times higher readout frequency for 10 mm2 sensor it will collect equivalent signal to a 100 mm2 sensor. What will happen if we run a large sensor at the high count rates? Let’s assume that a 100mm2 sensor in this example can utilize the 100 ns rise time. In this case, since the rise time is much shorter than the charge drift time (~1 µs), not all electrons, produced by an X-ray event, will be collected. This shortage will result in an incomplete charge collection effect (ICC), which will be introducing artifacts and deteriorating the energy resolution. A single characteristic X-ray for Cu (L) and Cu Kα will generate around 245 and 2115 electrons respectively in Si, which will drift to anode, forced by applied bias, in quite large electron packets. Such large electron packets are rapidly expanding during the drift with ultimately linear expansion rate vs drift time. If the rise time used to collect the electron packet is too short, some of the electrons in the packet will be ‘left out’ which will result in less accurate charge counting and consequently less accurate readout of the X-ray energy. This artifact, called a ‘ballistic deficit’ (BD), will be negatively affecting the energy resolution at high count rates. It is important to note that both ICC and BD effects for the large sensors are getting more enhanced with increasing energy of the characteristic X-rays, which means the resolution stability will deteriorate even more rapidly for higher Z elements compare to the low energy/light elements range. As the factual illustration to this topic, the actual SDD performance for sensors with different areas is shown in the Fig. 1. It displays the effect of the acquisition rates on the energy resolution for the EDS detectors having different sensors size and electronics design. 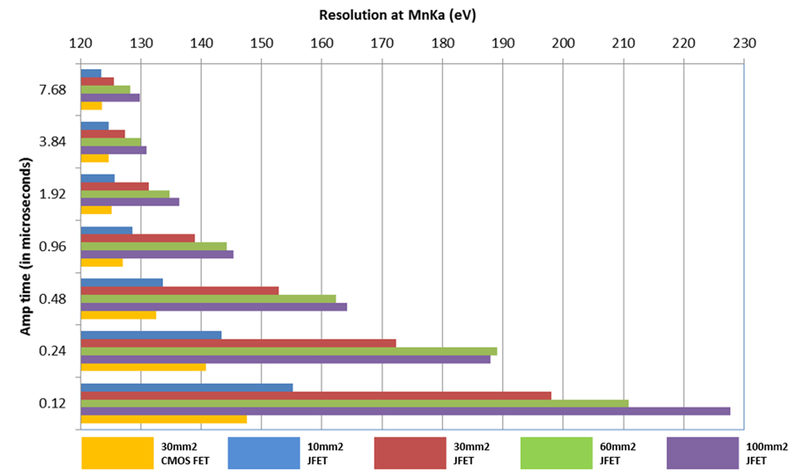 Two clear trends can be observed – a rapid energy resolution deterioration with increase of the sensor size for the traditional electronics design; and much more stable resolution performance at high count rates for the sensor with new CMOS based electronics. In particular, the data for Elite Plus with 30 mm2 sensor shows stable resolution below 0.96 µs shaping time, which corresponds to >200 kcps OCR. In conclusion, conceptually, employing a smaller sensor with optimized signal collection efficiency at higher count rates does offer an attractive alternative to acquiring the X-ray signal matching the one from large area sensors, yet combined with high throughput and improved energy resolution. Ultimately, the ideal solution for low flux applications will be a combination of several smaller sensors arranged in an array, which will combine all the benefits of smaller geometry, higher count rates, higher transmissivity and maximized solid angle. * SDD performance data courtesy of the EDAX Applications Team.